Perfumes are the perfect finishing touch to an outfit and I have to say I am a bit of a hoarder when it comes to fragrances. It’s been one of my goals for the last couple of years to use up my perfume collection. Still working on that, but for now here are my current three in rotation. Escentric Molecules has been “that” perfume in the blogosphere for years. If you haven’t heard of it then lemme break it down. It’s made up of a single molecule called Iso E Super which meshes with your own scent creating an irresistible and seductive smell. On me it’s a slightly woody peppery scent that sticks for hours. When applied it’s barely noticeable, but it catches you off guard and I’ve picked it up again during the day. Friends have commented how good I smell, and it’s one of my best pals staple perfumes. I can pick it up before she even comes into a room. It is honestly one of the best fragrances out there and I urge you to try it. Elizabeth and James Nirvana White has been one that’s held a top position for a long time, so much so I think it’s about on it’s last legs, which makes me sad. It’s such a gorgeous light floral scent with hints of peony, musk and lily. It’s such a wearable everyday fragrance that is suitably unoffensive. It’s lasting power isn’t it’s main selling point, but I can’t help but love it once it’s applied. Uber feminine and not overpowering, dreamy! Finally its Balenciaga Florabotanica which if we are discussing unique scents, this certainly ticks all the boxes. 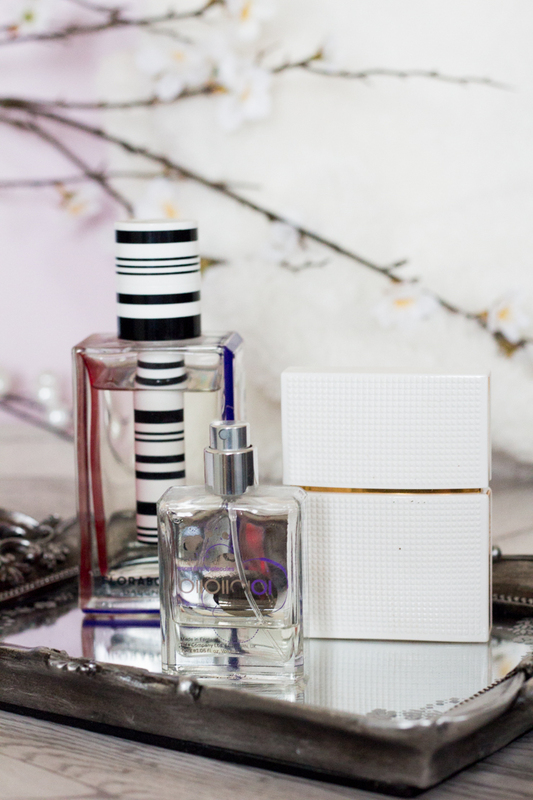 Firstly the packaging is so striking with the black and white striped centre, but the scent is incredible. With my favorite base notes of amber, this also include flowers like rose, carnation, mint and er, weed. Yup, you heard it here. Weed. IN OUR GOOD CHRISTIAN SUBURBS (reference here). It’s one that really caught my attention and I’ve used a fair bit! Seriously, next time you’re near a counter go along and smell it. I think you’ll be quite surprised! What are you favourite perfumes? I’d love to know!